This Irish blanket is an ideal gift for baby's christening. Each corner of this Irish baby blanket features an embroidered gold Celtic cross that is enhanced with knot-work. 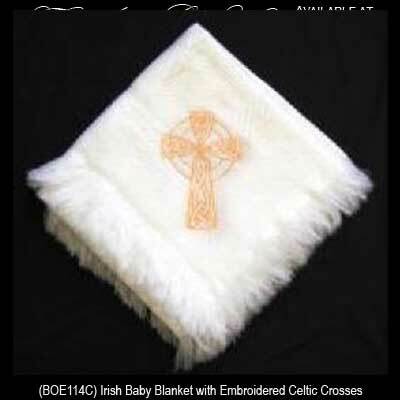 The soft Celtic cross baby blanket is 100% white acrylic and measures 48” wide x 48” long. This Irish blanket is received with Celtic cross and Celtic knot history cards, complements of The Irish Gift House. Please note that hand washing is recommended for this imported blanket.